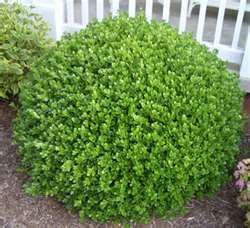 Korean Boxwood is a dense, compact evergreen shrub. The small leaves are light to dark green and turn yellow-brown to purplish in winter. It has fragrant, inconspicuous yellow flowers in spring. It will grow to a height of 2' to 3' and a width of 4' to 6'. Korean Boxwood likes to be planted in full to partial sun.